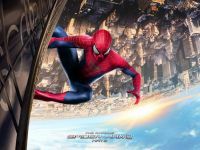 Photo by Columbia Pictures and Marvel. I took my son to see the latest offering in the Spiderman franchise. He is not as cynical as me yet, still young enough to be into the superhero thing. I got the spectacle I more or less expected: graphic effects so crystalline they were unreal, pointless violence, huge explosions. It isn’t a bad piece of work for what it is, and if you are planning to see it yourself, you should stop reading now. I’ll be giving away the ending in the next paragraph. I did not expect an unhappy ending. At the end of the film, the hero fails to save his girlfriend. We are all set up to expect a miraculous rescue. But he is just an instant too late, a fraction too slow. In short, he is human, and she pays the human price along with him. This is a theme of the movie: we make our choices and live or die with the consequences. We accept the risk of living. We accept the risk of trying to do something good. And we are all of us frail and vulnerable, even the eponymous hero of the franchise. Throughout the story, Gwen Stacy wants to go into danger with Peter several times. They argue, he ultimately accepts her demand to be treated with dignity: the dignity of risk. She claims the right to choose danger, to accept the risk, to be free. Freedom comes with costs. In an earlier franchise (as well as in the ink version?) a direct link is made between power and responsibility; here we get to examine freedom in the same terms. Victor Frankl likely never expected to be in agreement with a cartoon character, but here we are: freedom and responsibility are two faces of one being, a Janus head creating the illusion of two beings. In our clinical work, how careful are we to respect the dignity of risk inherent in each client or patient? To let them choose their own way whenever possible, even if that own way is risky, and even if that risk is very serious? Gwen pays the ultimate price for her freedom in this story, but it is Peter who suffers. Gwen is merely dead. Peter has to ruminate thereafter over his failure and his loss. To grapple with his limitations. His very human limitations. In the end, the makers of this movie seem to be suggesting that there is something more important than success or failure: giving it all away. Trying. Making the effort. The person who stays on the straight, narrow path never does anything remarkable. And if we are boring sheep, evil wins. Winning against evil is not necessarily defeating evil; there will be evil always. Winning is doing all you can do to oppose it, standing up, even if this is costly. Especially if this is costly. Dying is not losing if one dies for something rather than for nothing.